A event that seems to need reporting on in a climate forum. What record was broken? Something about anomalies? What anomalies? (1018) Don't worry it can't be measured according to you so don't bother reading it. And that post was up for 5 minutes before you commented on it, don't you have better things to do? spot wrote:Don't worry it can't be measured according to you so don't bother reading it. So you were yet again gullible enough to fall for a chart that doesn't measure anything? spot wrote: And that post was up for 5 minutes before you commented on it, don't you have better things to do? I have no control over when you post something. Do you actually time your posts to coincide with when you know I'll be coming online? I'm honored. (934) Average temperate is irrelevant. First, it's impossible to measure average temperature of world. To do that would need to measure every temperature at every point in the world. That's impossible. Second, average temperature means nothing. The Moon is either extremely hot or extremely cold. Average temperature does not indicate how hospitable an environment is. Average temperate is irrelevant. First, it's impossible to measure average temperature of world. To do that would need to measure every temperature at every point in the world. That's impossible. Second, average temperature means nothing. The Moon is either extremely hot or extremely cold. Average temperature does not indicate how hospitable an environment is. There isn't even an average temperature. There is no instrumentation available to take it. There is no instrumentation available to take it. One thermometer for the whole world? That must be some thermometer! (1018) They use more then one. They use more then one. 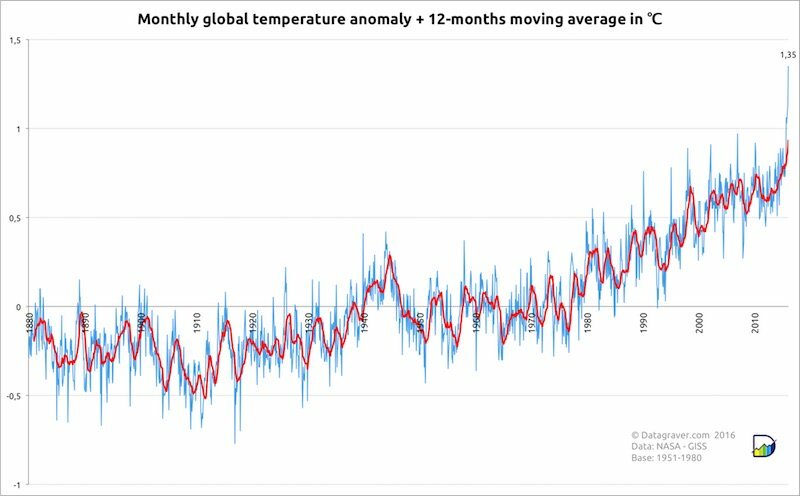 How many does it take in a uniform placement to get anything like a global temperature? It's what you were led to believe? That's quite a bit of faith to expect others to accept without question, even if you won't question it. Do you really believe that? Are you just rationalizing the futility of your claim?